As part of LoGiRL's 2016 feature on Tokyo Joshiryu, they had solo interviews with each of the girls. The interviews have the girls looking back on their tumultuous 2015 - in which they declared that they were 'artistes', and lost member Konishi Ayano - as well as touching on their thoughts about the future. Here are some translated excerpts from Yamabe Miyu and Shoji Mei's solo interviews. Konishi-san announced her graduation on the 28th of December 2015. When did the members find out about it? Ayano met with the staff during the later half of November, which was when Ayano expressed her desire to graduate. However, she met with us the following week as it was only proper for her to inform the members herself. Then she herself informed us that she wanted to graduate. When you found out about how Konishi-san felt, how did you feel? I'd always thought that we'd go on as a five person group, so I couldn't believe it immediately. It was like something unthinkable was happening. When you met with Konishi-san, what did you talk about? I really didn't want her to quit, so I asked her not to. But the decision to graduate was Ayano's, and it wasn't my problem, it was TGS' problem, so I felt that it might be wrong for me to push on with my opinion... And then, the 5 of us discussed it together, and reached the conclusion that she would graduate. In the end, we agreed that despite going down different paths, we'd each go on doing our best. And Konishi-san announced her graduation about a month later. Up until the announcement, my emotions were a bit mixed. We were doing live performances, and the fans were expecting Ayano to come back someday... 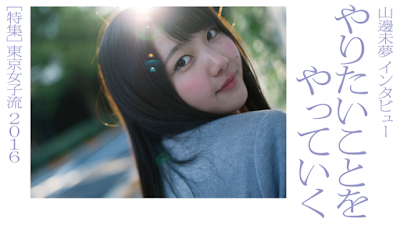 It was the toughest when we held a fan club event just a couple of hours before the announcement of Ayano's graduation. Since we did an introduction touching on the memories of the five of us. Once Konishi-san's graduation was set in stone, were there any changes to your mental state? As for my mental state, I couldn't really accept the graduation up until it happened. Even when I laughed, my smiles would end up being stiff somehow... But after some time had passed, my feelings changed completely. I started to think that the four of us had to do our best. Konishi-san announced her graduation in December last year. What did you think when you first found out about it? We were a group that had been going on for five years since our debut without a change in members, which is something that's pretty rare. It was like our forte, our source of confidence. But when Ayano said that she wanted to graduate, it was a huge shock, I really hated it, and I was also worried about how things would turn out beyond that. How did you feel towards Konishi-san? I felt that a lot of the fans would prefer Tokyo Girls' Style as a five person group, and I too would like to have activities with the five of us. So I hoped that she would somehow reconsider the graduation. I actually did mention those feelings to Ayano, but her heart was set. What goal have you set upon now? To have one more concert at the Nippon Budokan. You've held performances at the Nippon Budokan twice in the past. Why the 'one more'? Your 'past selves' refers to the Tokyo Girls' Style of when? Roughly about when we did our first Budokan performance (December 2012). We were really reckless back then, with lots of charms that we could only bring out at that time. Watching videos of our live performances back then, we were such children, and there were lots of things to improve on in our own performances. But because of that recklessness, we also shined a lot. I think that the fans might have been charmed by how we shined. In the future, what would you like to attempt as an artiste? I'd like to learn more about writing lyrics. While I wrote the lyrics for 'illusion' (recorded in 'Reflection'), I wrote it by fully becoming the protagonist of the song, and then I put the tale into lyrics, so it's not like I was expressing my own feelings. And so, I'd like to put my feelings into lyrics next time. For example, love songs based on your actual experiences of love...? Actual experiences, huh...? But, apart from romance, the fact is that there's this gradually growing desire in me to express my actual feelings in song. How about for live performances? Fundamentally, I think that we have to properly hold performances that all the fans will enjoy. Beyond that, it would be nice to do what we want to do. We've become involved with crafting our live performances, so we've started thinking deeply about that balance. Well then, finally, Shoji-san, what is your personal goal? I'd like to work harder on English. Since we want to spread out through the world, like to Asia and Europe, not just Japan. I've always wanted to learn English, but I haven't really been able to do it.. I'd like to work hard on studying it until I'm actually able to speak it.